Despite its perfectly polished appearance, Genoa’s oh-so-comfortable stretch textile upper makes this loafer a joy to wear. From the office to after-work drinks, Genoa’s decorative, adjustable animal print strap lend serious sophistication to this covertly cozy classic. 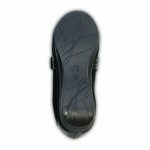 These fashionable shoes for orthotics also feature a removable footbed.